ST. LOUIS (AP) — A massive winter snowstorm that blanketed several Midwest states was a factor in at least five road deaths on Saturday and forced the grounds crew to scramble to clear snow from Arrowhead Stadium in Kansas City ahead of the NFL divisional playoff game. The storm moved into Kansas and Nebraska from the Rockies on Friday, then east into Missouri, Iowa, Illinois and Indiana, covering roads and making driving dangerous. Part of Interstate 44 near St. Louis was blocked for several hours Saturday, and at one point the Missouri State Highway Patrol warned of traffic delays as long as eight hours. In Indiana, the northbound lanes of Interstate 65 were closed for hours Saturday after a semitruck jackknifed along the snow-covered highway near Lafayette, about 65 miles (105 kilometers) northwest of Indianapolis. The storm began to spread east into the Mid-Atlantic region, with between 5 and 10 inches (13 to 25 centimeters) of snow expected in the Washington area, including parts of northern and central Maryland, by Sunday. Forecasters said heavy snow could fall in mountain areas north of Interstate 64, such as Charlottesville and Staunton, Virginia. Gov. Ralph Northam declared a state of emergency Saturday night to help the state of Virginia prepare. Missouri had gotten the worst of the storm by Saturday, with the National Weather Service reporting more than a foot (30.48 centimeters) of snow Saturday morning in some places around St. Louis and Jefferson City, and more than 18 inches (45 centimeters) in Columbia. 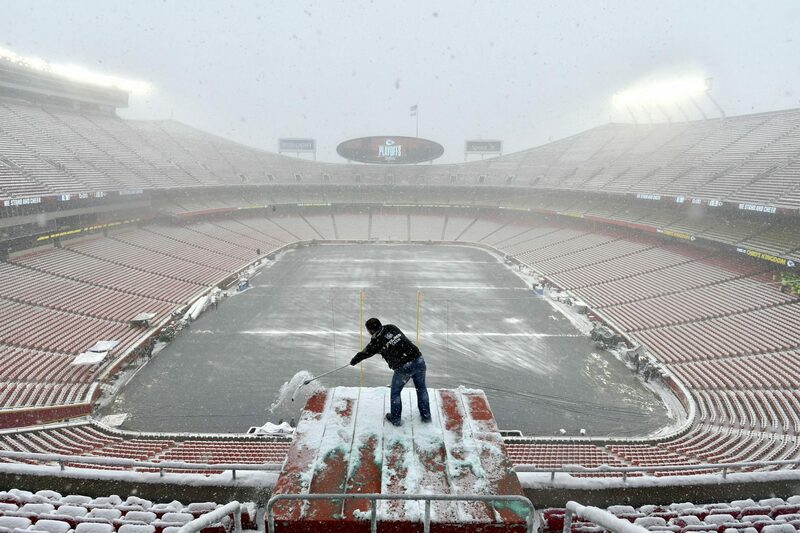 In Kansas City, where the Chiefs were hosting the Indianapolis Colts on Saturday, about 8 inches of snow had fallen by early afternoon. The snow had tapered off by the time the game started midafternoon, but stadium crews worked for hours before the game to clear the stadium's lot, field and seats in anticipation of a full house for the playoff game. At least five people were killed in crashes on slick roadways in Kansas and Missouri. They included a woman and her 14-year-old stepdaughter whose car slid into the path of a semitrailer in Clinton, about 80 miles (130 kilometers) southeast of Kansas City, on Friday, the Missouri State Highway Patrol said. Another woman died when her car slid on U.S. 24 in northern Missouri and was hit by an oncoming SUV. In Kansas, a 62-year-old man died after his pickup truck skidded on the Kansas Turnpike and hit a concrete barrier, according to the patrol. Another crash involving two semitrailers in snowy conditions killed a 41-year-old driver from Mexico, the patrol said. "We're anticipating still more snow through today, so we're asking motorists to stay home until the roads are cleared," said Missouri State Highway Patrol Sgt. Collin Stosberg, stationed in suburban Kansas City. "If you do have to get out on the road, we're asking you to do three things: Have your cellphone fully charged, wear your seat belt and slow your speed for the conditions." Missouri troopers responded to more than 3,000 calls for help through early Saturday afternoon, including more than 700 crashes and 1,300 stranded vehicles. Illinois State Police said troopers along the Mississippi River across from St. Louis have responded to more than 100 crashes during the storm. In central Missouri, officials said about 12,000 households and businesses were without power in Columbia and the surrounding area at one point.